At the National Rifle Association’s national conference in Atlanta I visited briefly with Donald Trump, Jr., Sheriff David Clarke, Dana Loesch and Wayne LaPierre. With an attendance of over 81,000 people, it ranked second only to the 86,223 that attended the 2013 NRA Annual Meetings & Exhibits in Houston. President Trump spoke at the event, and was the first President since Reagan to do so. I also co-hosted a workshop on the best ways to buy, sell and store gold and add precious metals to a diversified portfolio. I began by speaking about how the Trump administration has helped to boost the price of gold and increase consumer interest in gold. 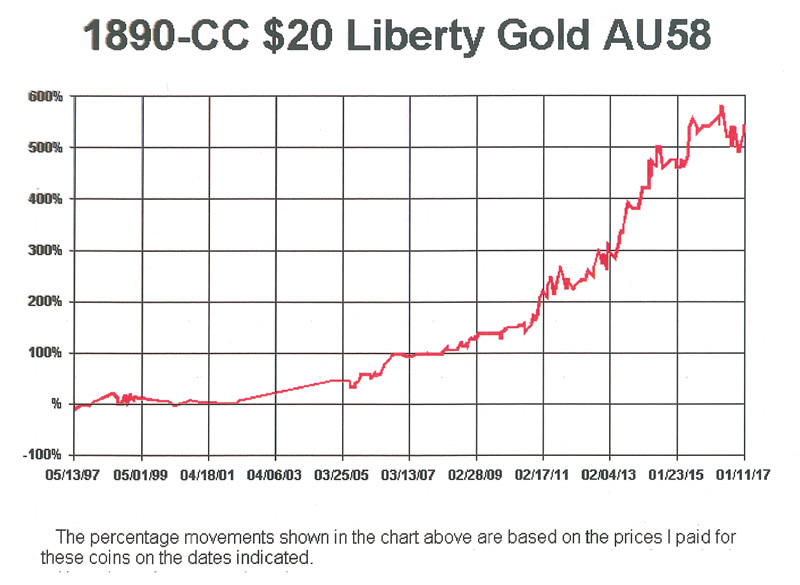 We’ve certainly seen sporadic increases in new customers buying gold as well as existing customers purchasing more expensive coins since Trump was elected. We had more people come by our booth than at any prior NRA Meetings and Exhibits. As the Official Bullion and Rare Coin Expert of NRA Publications, our company also co-sponsored the NRA Prayer Breakfast on Sunday attended by over 1,000 people. 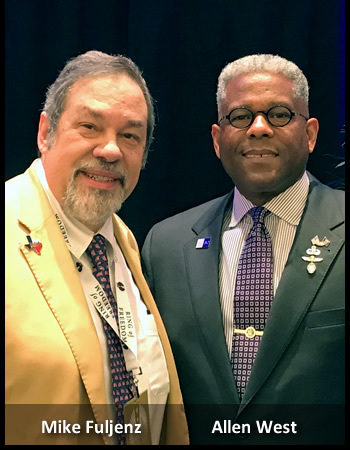 The featured speakers were our own Forest Hamilton and former member of the U. S. House of Representatives, Allen West. In addition, our booth offered copies of my acclaimed book, Type Three Double Eagles 1877 – 1907, 2nd Edition, which received the Book of the Year Award from the prestigious Numismatic Literary Guild. One of the highlights of that book is a series of charts for many issues of Type Three Double Eagles. There has been particular interest in the Carson City (CC) issues, beginning with the 1870-CC, with impressive price gains. There is something about the lore of the Wild West in these $20 Carson City gold coins. They weren’t minted every year and are very lustrous, beautiful specimens. For those interested in history and gold, this book is essential for any gold coin collector and investor. Call us to acquire one and I will autograph it. Gold closed April up 10.3% for the year vs. 6.0% to 6.5% for the two major stock market indexes. Part of the reason for gold’s decline last week was the outcome of the first stage of the French election on Sunday, April 23. A “moderate” candidate outpolled the more extreme nationalist, Marine Le Pen, but there will be runoff next Sunday, May 7. The polls say Le Pen will lose to the mainstream candidate, Emmanuel Macron, but the polls were wrong about Brexit and Donald Trump last year, so they could be wrong in France as well. If Le Pen scores an upset victory, we can probably expect gold to recover. Barring that, there are rising tensions in Iran, Syria and North Korea which could propel gold higher. Gold demand was lower in both India and China last year due to regulations and a jewelers’ strike in India, and a slumping stock market and slowing economy in China. However demand is turning around in early 2017. China and India are still the #1 and #2 countries for gold demand, so investors tend to watch those nations more closely than any other gold markets, and we’re finally seeing some good news. The Chinese economy is recovering, spurring demand, and Indian customers are buying jewelry again. In China, exports of gold to mainland China from Hong Kong more than doubled in March, according to data released by the Hong Kong Census and Statistics Department. China’s gold imports from Hong Kong more than doubled – rising from 47.9 metric tons in February to 111.6 metric tons in March, the highest monthly total in 10 months, and 56% more than last March. Gold is a hedge against a potential devaluation of the yuan, and gold is performing better than Chinese stocks or other available investments.